This Best Practice document includes standards that help guide those seeking to ensure an ethical basis for product development involving designers and artisans. They pertain to situations where the concepts of a designer and craft skills of an artisan are combined to develop a marketable product. It presumes that the processes of ideation and realisation are of equal value, despite the presence of hierarchies that place thinking above making. The following are draft standards related to product that emerged from the workshop at National Association of the Visual Arts, Sydney on 6 August 2012. 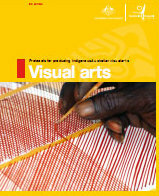 They are based on the Protocols for Producing Indigenous Australian Visual Arts. These will be circulated for discussion and further discussed at the roundtable in Ahmedabad on 23 November 2012. These follow from the draft standards for labelling established in 2011. The relationship between designer and producer is one of mutual respect. These standards are proposed for those who want to recognize the qualities of the relation between designers, producers and users. It acknowledges the importance of both producer and designer in the making of work. This enables the value of the product to extend beyond the mere object, to include the long-term positive effect of the production itself. This relationship is collaborative and involves recognition of equal status. Part of the acknowledgement of equal status involves accounting for the contribution of each. Design, craft and production are all activities and skills that are valued for their quality and uniqueness. Both the designer and craftsperson are known by the importance of their roles and for the quality of their work. The relationship between designers and producers should be one of mutual respect and equal status. The use of the design should be controlled by the one who creates it or brings it into the relationship. 1. Seek permission from communities if you seek to use their designs. 2. Seek permission from designers before copying their designs. Those who have been commissioned to realise someone else’s design should not make copies or distribute that design without their permission. 3. Allow for collaboration in the making. Those seeking the services of a producer to realise their designs you should have respect for their skills as a creative contribution to the final product. Providing space in design for interpretation from the maker can give added value to the production process. This relationship is shaped around the understanding that the use of the design should be controlled by the one who creates it or brings it into the relationship. Many designers, craftsmen and producers bring traditional knowledge into the relationship of making and producing artefacts. It is important that this should be acknowledged.